The Wellesley London hotel in Knightsbridge. IT’s David Whitley goes undercover to review The Wellesley London to see if it lives up to the six-star hype. My wife had her adamant tone fully installed and operational as she sat down on the bed, stating the case for raiding the mini-bar. I turned around. She had somehow managed to fall asleep mid-sentence. It seems the beds at The Wellesley are not just hyper-comfortable – they have bizarre magic powers as well. Given that beds are the primary reason for staying in a hotel, truly great ones don’t get enough praise. And these multi-layered, Princess and the Pea-style beauties deserve an elaborate fanfare of hallelujahs. They cocoon you as you sink in, off-the-scale thread counts wispily brushing against your skin, whilst simultaneously giving the support of a million hands lifting you upwards. When the hottest new addition to London’s luxury hotel scene was announced, the hyperbole machine went into overdrive. Khalid Affara, the Yemen-born MD of parent company Arab Investments, went on record bragging that the 38-room Wellesley would be the city’s first six-star hotel. Perhaps wisely, such hubristic talk has been played down since opening late last year. The six-star nonsense was just an indication of the level of service guests can expect, the operations manager says when prodded about it. At the Hyde Park Corner end of Knightsbridge, the building The Wellesley occupies has a colourful past. The blood-red tiles above the entrance are the unmistakeable hallmark of architect Leslie Green, the man who decorated many of London’s most beloved Tube stations. In the journey from abandoned underground station to A-list accommodation, the building has been a townhouse, an office block and a pizza joint with a reputation for hosting top notch jazz. Well-heeled locals would come to listen to the likes of Mica Paris and Amy Winehouse over their margherita. This jazz heritage is played upon in the décor, which throws guests back to the golden era of the ‘20s and ‘30s. 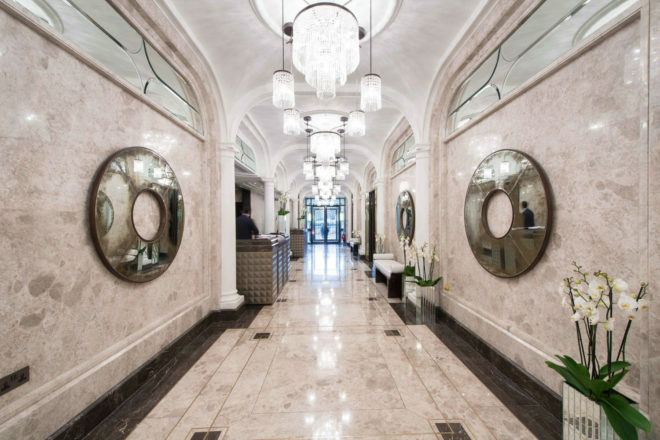 Art deco crystal chandeliers line the lobby, with the mirrored back wall and gleaming marble floor making it look a lot longer than it is. The corridors are liberally sprinkled with photographic prints of heyday stars; Rita Heyworth and Marlene Dietrich are dotted between dark wooden doors that have been buffed, polished and lacquered so thoroughly that you could use them as shaving mirrors. The starlet shots and glossy glamour continues in the room. Mother of Pearl drinks coasters and golden roll cushions are lit from behind a layered art deco ceiling. Pulling open the top drawer of the bedside table unveils a control panel with which you can flick between pre-set lighting moods. Underneath the absurdly large 52 inch wall-mounted TV is a Samsung tablet loaded with information about the hotel and surrounding area. And the bathroom uses the same marble and mirror trick as the lobby to bathe it in an opulent dazzle. The elephant in the room, however, is that you really couldn’t fit an elephant in the room. The bed dominates it, and there’s no real space for flinging down Harrods or Harvey Nichols shopping bags, let alone swinging the proverbial feline. Claustrophobes will need to consider an upgrade to a junior suite (although they’re hardly huge either). The selling point isn’t size, however – it’s service. And that’s still suffering from just-opened jitters; eagerly skittish rather than effortlessly smooth. Running a gauntlet of rapid-fire hellos and good mornings between entrance and elevator quickly gets annoying. The Wellesley, as so many other luxury hotels seem to be doing at the moment, offers a private butler service. It’s glorified room service with a single contact point – however, two butlers are working the whole joint. There’s also the promise of free Rolls Royce transfers within a mile-and-a-half radius of the hotel. When we tried to get a free ride to the Natural History Museum, we were asked if we could wait 20 minutes as the driver was busy. Given that two Rollers were parked outside, someone seems to have got the staffing sums wrong. Where The Wellesley transcends London’s other plush pads is in its creation of an inclusive community hub, but with an exclusive vibe that makes all who enter feel special. In an embrace of its heritage, The Wellesley has set aside one room for jazz gigs. Opposite is the tiny Oval Room restaurant, an unquestionable triumph of intimacy and rapture-provoking high end Italian cuisine. From winter vegetable salad and roasted scallops, to saddle of venison, rack of lamb and dark chocolate fondant with amaretto ice cream, we routinely hailed each generously portioned dish as being a class above any other version we’d tried elsewhere. The Crystal Bar comes with an outdoor fireplace, a roofed terrace lined by roaring heaters and two glass treasure cabinets full of rare whiskies and cognacs. A dusty, earth-specked Cognac bottle from 1770 has pride of place, seemingly challenging the uber-rich to splash out on a £4000 shot of history. It’s the smokers who are in for the real treat, however. Another heated terrace circumvents the UK’s anti-smoking laws, and it’s backed up with what is billed as the largest humidor in the country. I’ve never had the willpower to take up smoking, but even an avowed cigar-shunner can’t help but appreciate the majesty. An immediate waft of rich, chocolate-smelling tobacco hits as you enter, while rare boxes sourced by the staff on their regular trips to Cuba are lined up in protective cabinets. There’s over a million pounds worth of hand-rolled high life inside; the cigar Crown Jewels. David paid $460 for a Deluxe King room including breakfast.